Page 11 of 11 Official Hold'em Manager Support Thread Register or Use the arrow to the right to read the other 10 page(s). I've done a lot of searching and I can't find a way to do this: I'd like to filter for hands not tagged at all, or not tagged a certain way. For example, each time I review a hand, I tag it reviewed. Now later, say I want to look at all my hands that went to showdown, but I don't want to see any hands I've already tagged as reviewed. For the life of me, I can't find a way to do that. Any suggestions? It is not possible to do this. Which networks are now fully supported? A lot of networks have updated their policies and do not provide complete histories. I know that PartyPoker witholds aliases in hand histories in cashgames. Can you make a list which sites are fully supported, and which partially? I'm also interested in Asian sites like GG network, PPPoker, Poker Master. Also Winning Poker Network, Microgaming, etc. Party has anonymized cash games. Microgaming does not write full hand histories. We do not support GG or PP, but there's the pokermasterHUD that converts hands. I cannot open HM2 after the latest update. For some reason it now takes me to a Start Trial pop up... I've done everything to get it to work: created a new free trail, put in my active license code, went to HM FAQs and did every step that it required (I reset the profiles/keys, deleted the holdemmanage.hml, etc.) and still can't get it to open. Please help. You can always find it in our support pages - downloads. None of this worked. I never got that Start Trial pop up before the latest update. You guys need to fix that ASAP. - If you have 64 Bit Windows you have to install vcredist_x64.exe and if you have 32 Bit Windows you have to install vcredist_x86.exe. Please let us know if that solves the problem for you. What Category out of the 7 should I choose to send my Hm2Logs to? Thanks, that last link actually worked. One last unrelated question: How can I turn chips into BBs on HM2 and have them displayed on my screen as BB along with my bet sliders? Thanks, that last link actually worked. The last link was a last resort way for you to be able to use HM2 while we reviewed the logs you sent us as instructed in the 3rd link/step. Please update, reproduce the problem, then send us the log files before you rollback to version 8536. One last unrelated question: How can I turn chips into BBs on HM2 and have them displayed on my screen as BB along with my bet sliders? You can add a Big Blinds stat to your HUD but it is not a live stat. It is based on the end of the last hand that was played/imported. If blinds go up the next hand HM2 will not know until after the hand finishes so it will show the wrong number of blinds during that hand. I did that the update again as instructed and same exact problem happened. So you want me to send you the log files again or you want new log files? If you installed the proper version of VC++ 2013 and still can't update HM2 you need to update and reproduce the problem then send us a new set of log files before you roll back to version 8536. Just to clarify, I did installed the right version of VC++2013 as you directed and I couldn't open the HM2 with that latest update that you guys have. The older version of 8536 is the only one that is working for me. If I update to the newer version I get the same problems I was having. With that said, u still want me to send more/new log files of the updated HM2 that still crashes/doesn't let me register? 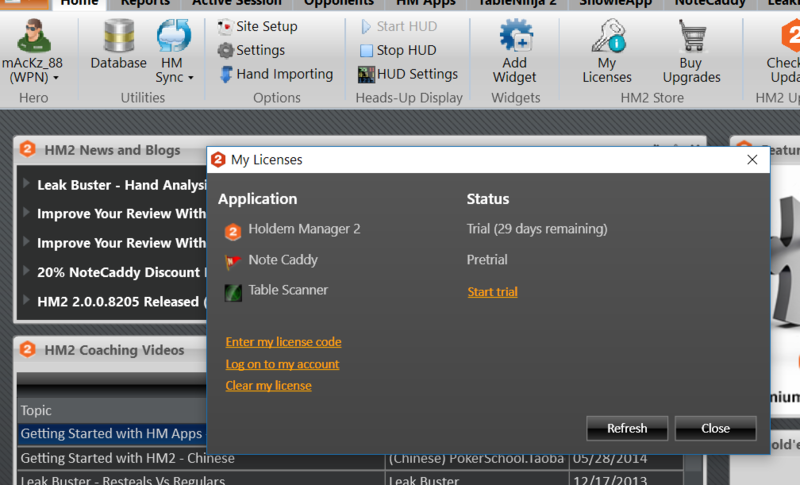 I have downloaded the program HM2 yesterday to give it a trial run before buying. It worked fine all day, but the today, it crashed midway through a tournament. Now when I start the program it asks me if I have a registration code .. yes/no, I select No, then it asks if I want to buy one? I say No, because I want to continue to use trial before I make the decision to buy. It just closes after, so I can no longer access the program. I thought this was a 30-day trial, or is there some other limitations? Maybe I missed something. Help or clarification would be appreciated. I have searched and found the proper literature on the subject. I was able to reset the program and register my trial subscription. It got me back into the program, and I was able to verify I still have 29 days left in my trial subscription. When I close the program and open it again, it asks me for a registration key and will not let me re-enter the program. Very frustrating!! Please help. Yes, you need to reproduce the problem and send us log files then rollback to an older version. We need to help you solve the update/registration problem now so it doesn't affect you again in the future. That is not something we can help with on the forums for security reasons. Please email your questions to to our sales team via the 'https://support.holdemmanager.com/' link. What is the situation with HM3? Latest beta is from 04.05.2018. I am using it since around 6 months and like it in general but the graphical HUD bug that i reported few months ago is sometimes annoying. Do you plan to release new beta (or maybe final version) soon? We have not pushed a new beta to all testers since version 5345. We have only been sending updates manually to those reporting problems or bugs, as we are now in the final push for a HM3 release starting some time early this year. Please reproduce the problem and click the 'Send Feedback' button from the left sidebar menu (or from the 'Help' menu at the top), or choose 'Yes' if prompted to submit an error report, and send your logs and config files with a detailed step by step description of the problem so that we can send you a download link for the latest beta version of HM3. If our latest HM3 has the same graphical HUD bug you will need to report it again with the new build by sending another set of logs from our latest build. Good afternoon, my HM2 is not recording the cash prizes received at the American Cardroom tournaments, however the hand history is being saved and the HUD is working perfectly. Can you tell me how to fix this little problem? Issue:Graphical HUD is misplaced when moved to a new table in MTT. I have not received any feedback since then. If you have patch to fix it please send it to me. Good news that we can expect final version soon. Thanks for the update. That bug ticket, and any others related to the graphical HUD, are low priority issues right now and have been assigned to our 'backlog'. We will start going through the back log issues after HM3 is released and work on all those issues as time allows. SNG or MTT? They don't write summary files so it hard for us to detect the results. HM3 should do better than HM2 with SNG but both will fail terribly with their MTT since they do not write summaries. If you continue to have problems please zip and email the problem hand histories and tournament summaries to us, with a link to this thread and your forum name, using the 'https://support.holdemmanager.com/support/product/1' link. Hello. I download a HM2 but HUD dont work. Maybe it is because my PS acc haven't real money? So I can use HM2 in freerolls? HM2 doesn't support Play Money on any site. HM3 will support stars Play Money tables when it is eventually released. Hello! Tell please works whether hold'em manager with the Grosvenor casino poker room? I am not sure what the network is. We only deal with networks, because there are way too many skins. Hi, does the HM2 trial version allow a user to create reports that separate hands by blind level? The only limitation in the trial is that it is 30 days. You want to use the Winnings Summary report. Does the program not work in the aconcagua room? I do not know what network that is on. support with a hold'em manager is nice, but how are you going to play live without having a stat about opponents and how they play the flop, turn and river !? my opinion --- learn to play yourself! never heard of this program, would it improve my game, or mess up my intuition? It's like taking notes, it can either confirm or fix intuition. We have a 30-day trial for you to see if you like it. Hello, I'm using HM3 and added some filters to the "Tournament Stacks" that stays in HUD Options. Such a function works correctly on most sites, but at PokerStars a warning appears that it is not possible to automatically filter, and I have to manually select each player for each hand. Is there any way to solve this? Stars changed some rules. 8578 has our update for the new rule changes to be in compliance. Anything that is not allowed is disabled. It will still work on other sites (where applicable) and the replayer. Page 11 of 11 Register or Use the arrow to the right to read the other 10 page(s).